Most Underrated Author? Really!? Cool!! Question: Which author, living or otherwise, do you believe deserves more recognition than they currently receive and why? "I'm to pick just one? That's tough. In that case, I'll toss Douglas Smith into the hat. With every new story, the more impressed I am with his subtlety and vision. I've yet to read a work of his that wasn't beautifully written, but more than that, his stories resonate with a deep understanding of the human condition as well as a characteristic wry wonder. Reminds me of James Alan Gardner, actually. Stories you can't forget, even years later. Doug's published extensively, though only in short fiction to date, but I believe he's also working on a novel. Thank goodness! When that's published, it will be on my must-read pile for sure." Thanks, Jules! 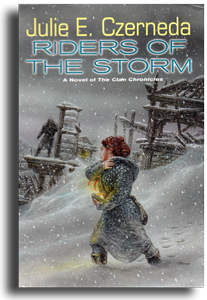 Julie is the author of The Clan Chronicles, including Reap the Wild Wind and Riders of the Storm, and the editor of Misspelled, all from DAW Books. Check out the entire SF Signal article here.